1. Hi Heidi,thanks to join in our interviews,so please introduce you first. 2. Your cosplay have been featured in many videos and anime magazines , so how did you get started in with cosplay, what was your first cosplay? My grandmother taught me to sew when I was very young – I think I was only ten years old when I was making my own clothing and costumes! I had a Nintendo, and was addicted to role playing games…my favorites at the time were the Final Fantasy series, and I adored the White Mage. So my very first costume was a White Mage from Final Fantasy, sewn out of a white bed sheet and decorated with a red sharpie marker, lol. Years later, I was still making costumes, but had gotten a lot better at it! I’d made friends with other costumers through the internet and my circle of friends, and in 2000 a bunch of us went to Anime Central as Final Fantasy characters – and Aeris Gainsborough from Final Fantasy 7 became my first “real” costume worn at a convention. I’ve since redone that costume twice, as I’m my own worst critic and the 2000 version of my Aeris was quite…interesting, lol. I didn’t even know anything about makeup or hairstyling or prop making then, and it really goes to show that practice does make perfect. 3. What has been your favourite cosplay? I get asked this question all the time, and I honestly can’t give a straight answer! The reason is, I put a lot of time and love into each and every costume I make, and they all have a special place in my heart and their own wonderful memories. Each one is like an old book you just love to reread – I never get tired of any of them! I guess if I had to pick the ones that mean the most to me, it would be because they’re based off my very favorite videogame or anime characters and because I’ve had so much fun in the costumes. The top three would be Katt from Breath of Fire 2, Blair from Soul Eater, and Aeris from Final Fantasy 7. 4. Describe your creative process for starting a costume through completion! Once I decide I want to make a certain costume, I make out a list of all the parts I need for it, and all the supplies I’ll need to buy. I save as many reference images as possible, as accuracy is very important to me, and sometimes bounce a few ideas off of friends to get opinions on how things might work or look. After I’ve got my supplies and ideas, I start making things! I’ll also sometimes sketch things out, to help envision my ideas. As I’m making things, I do a lot of mock-ups, tailoring, and fitting, which often has me running around the house in bits of costume parts, lol. But I need to make sure those boot covers will stay up, or that headpiece will fit through doorways! I try on clothing parts a lot – a good fit is very important to me and can make or break a costume, in my opinion. I’ll also sometimes multi-task by working on two costumes at once; sometimes I just need a break if I’m doing something difficult or tedious on one, and it’s nice to move onto something fresh and new until I’m ready to go back and tackle the first costume. 5. What is the biggest learning curve you have learned about the hobby in the past years? I’d have to say it’s pattern making. I’ve always had extremely strong sewing skills, and have been able to work with wigs and props, but when I first started making costumes, finding and altering patterns was such a challenge! A lot of costumes have designs you just can’t match with store bought patterns, so everything has to be altered or made from scratch. The more I started altering and making my own patterns, the better I’ve gotten at it. Some of the early ones I made were not so great, but everyone has to start somewhere, and now I know most basic pattern shapes from memory and just draft stuff right up with muslin. Some people get frustrated with something new and difficult, but if they keep at it, they can master it with time and practice! 6. You also love painting, drawing and write stories,you must get many cosplay ideas fro them, so any interesting wanna share. Actually most of my costume ideas come from my favorite games, comics, or shows. I’m just a really creative person who likes to branch out into all sources of expression! Being able to draw and paint does definitely help when I’m sketching out costume plans or an original design though, and it comes in handy when I have to do any kind of painted designs or intricate details on a costume or prop. 7. Do you have one piece of advice that you would give to cosplay virgins? Don’t let yourself be discouraged if you don’t think you’re good enough or can’t figure out how to make something – everyone has to start somewhere! No matter how skilled someone is, they too have suffered hot glue gun burns and backwards seams at some point in their years of costuming. With practice and patience, I believe a person can accomplish anything. And most importantly, don’t ever forget to have fun! A lot of people often get caught up in the stress of competing in costume competitions, or get upset because they can’t get a costume done in time or done the way they want it. Still others fall victim to cosplay drama. If I could give one piece of advice to anyone who cosplays or is interested in getting into the hobby, it would be this: cosplay is all about having fun; don’t ever lose sight of that or forget how to smile, laugh, and enjoy yourself! 8. Lastly, what is your con schedule looking like through 2013? I’ll be attending Anomaly Con, Starfest, Costume Con, Fanime, Denver Comic Con, and Dragon Con this year. We are Livvy and Adam. 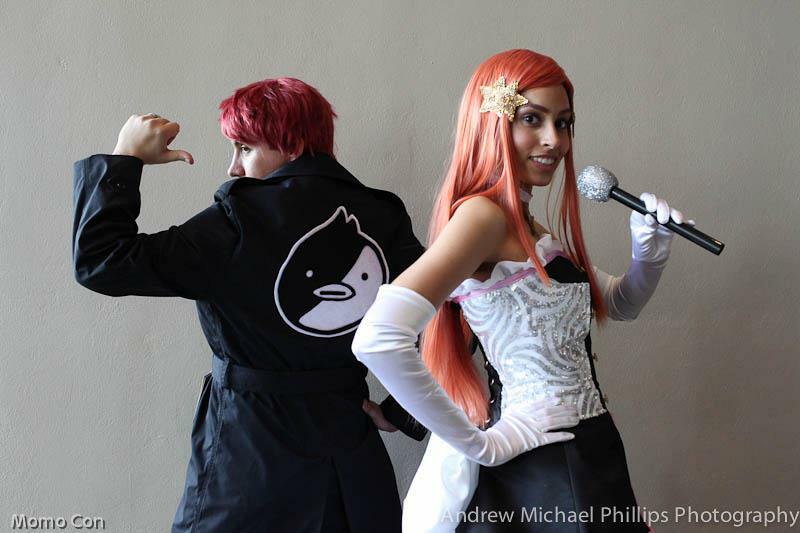 We have been cosplaying together since AWA 11. 2.How did you get started in with cosplay, what was the first cosplay? AWA 10 was our first ever convention. We fell in love with the costumes and felt so left out in plain clothes. After that, we decided the next convention we were going to cosplay! Since Ranma 1/2 is one of our favorite animes that we watch together, we decided to go with Ranma’s outfit. It was the first outfit I (livvy) have ever sewn and with the help of my mother we got our first cosplays completed! It was fun being the same character in boy and girl form and we have been cosplaying ever since. 3.What has been your favourite cosplay? Adam: My favorite was The Creep, it was mostly a closet cosplay, but it was more comfortable than our usual lot. Really enjoyed ‘creepin around Dragon*Con and rocking my pencil thin mustache. Livvy: Cure Blossom is mine hands down. Ever since we started cosplaying, I dreamed of doing a magical girl cosplay. The main problem with that is the male characters are often not masculine enough so they always got vetoed. That was until Heartcatch Precure! Kumojacky was the perfect shonen character in a magical girl show. So I got Adam to watch and we both loved (ok I loved, he was ok with it) the show and we started working on the cosplays. After a year and a half we finally got them completed and ended up even winning a Best in Show award for it! 4.Describe your creative process for starting a costume through completion! Usually we are watching a show or looking around online and say ‘Oh Wow that character design is awesome’ or ‘I really love this character.’ We tend to pick characters that we both feel comfortable cosplaying. Not only does it need asthetic, comfort and decency, but we must like the character enough to embody them for a day at the convention. We keep a master list of characters we want to cosplay and look at how much work it will possibly take and with our jobs will it be possible to complete. Many of our costumes are simple to just have fun, however, when we want to go all out, we research and innovate to reach how the character feels to us. 5.Do you have any favorite Asian films? 6.What is the biggest learning curve you couple has learned about the hobby in the past years? Adam: old style carpentry and staining techniques, hand stitching with a hammer. Livvylove: sewing more difficult fabrics, cobbling with pleather. 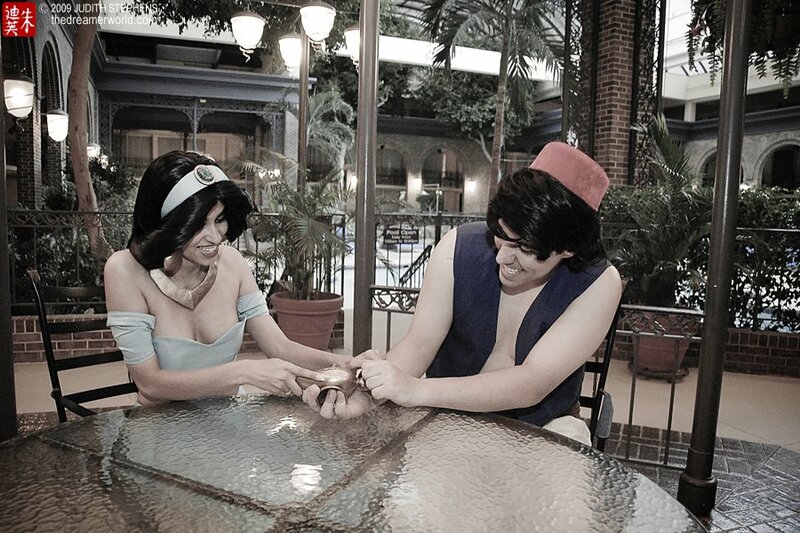 7.Do you have one piece of advice that you would give to cosplay virgins,especial couple cosplay? Always make time for friends, family, life, etc. Don’t let a hobby get in the way of your relationships (or job/education). 8.Lastly, what is your con schedule looking like through 2013? We plan on also going to Dragon*Con and Seishuncon as of now. 1. Hi SSJ4theo,thanks to join in our interviews,so please introduce you first. I am known as Living Ichigo to my fans. I am a professional cosplayer, model and bodybuilder. I have cosplay about 20 different cosplays varying from several forms of Ichigo from Bleach, Grimmjow, SSJ Goku from Dragonball Z, Gilgamesh from Fate/Hollow Ataraxia, Jecht from Final Fantsay 10 and many more cosplays. 2. You have got many rewards in different anime conventions, so how did you get started in with cosplay, what was your first cosplay? 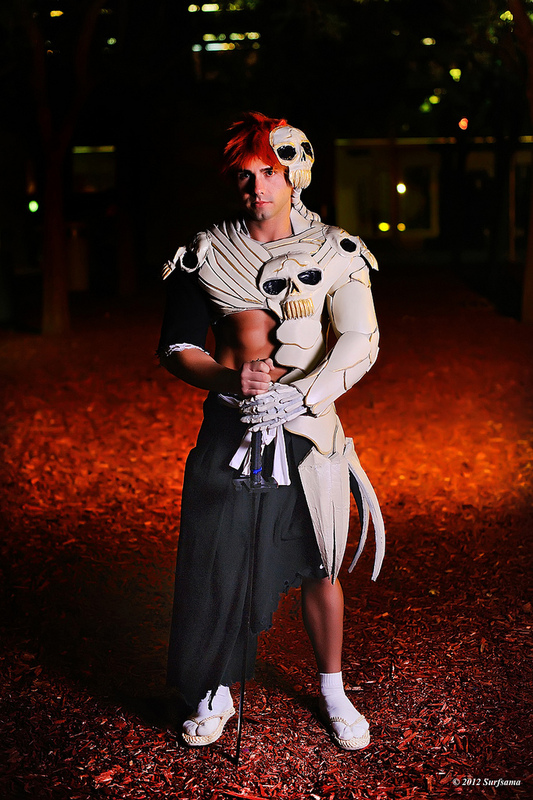 My first cosplay was Ichigo Kurosaki Bankai Vizard form. When I first began, I was very out of shape. I noticed that Ichigo was muscular and lean. That’s when I decided to dedicate myself to training. I wanted to become as close to him as I could. My favorite cosplay so far has to be my SSJ Goku cosplay, Goku is my favorite anime character. 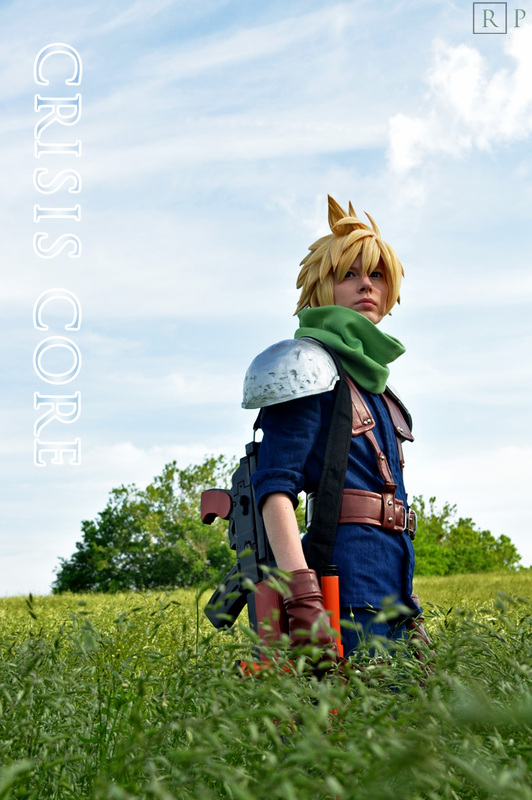 I have so many cosplay projects plans for 2013 its insane. To name a few I have around 5 New Dragonball Z cosplays planned for example SSJ3 Goku, also im going to cosplay as Kamina from Gurren Lagann, Zui from Zwei Soulcalibur, Nastu and Gray from Fairy Tail, a few Yu Yu Hakusho cosplays, and much more. With any cosplay project anyone would have to figure out the best way to construct their cosplays. I normally pull up many reference pictures of the character im going to cosplay as so I can have a ton of pictures of the character to make sure when i make the cosplay it looks just like the character. Anyone can get materials to make their cosplays from any local fabric store, I normally go when theres a sale to save money because cosplay is an expensive hobby. Also the fabric stores may have the patter your looking for for the costume or making, otherwise you’d have to maybe look online for a tutorial on how to construct the costume or make your own pattern. As for armor and props you can buy materials for that at any craft store or online or even an hardware store, just depends what you will be props out of. Also for wigs and contacts those have to be bought online from wig and eye contact stores. Then my girlfriend “JoJo Pandaface” and I have to custom style our wigs for our cosplay. Learning to sew was hard at first but armor and prop making can be very difficult at times, especially if your not experienced at it. There’s a bunch of times where I was working on a project that I had to completely throw out and start from scratch again. It’s the process of learning, learn from your mistakes. 6. 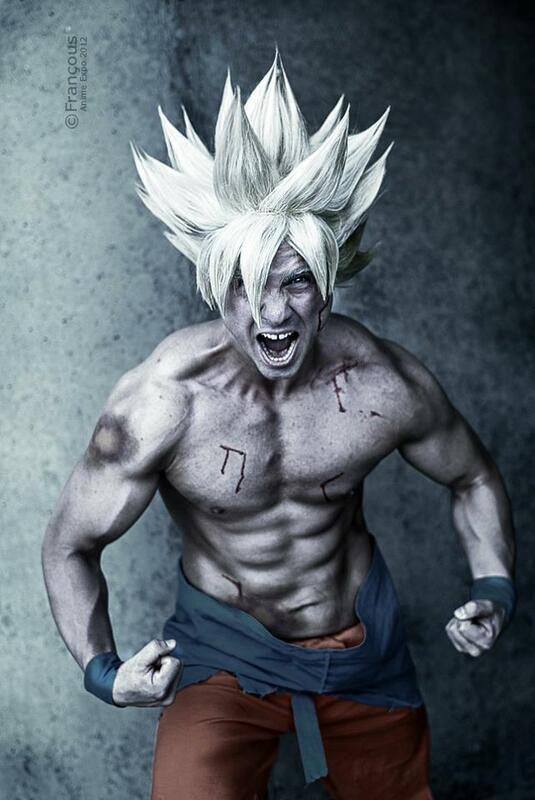 Tell us more about your Supper Goku cosplay ,I love this cosplay most, so any interesting wanna share? My Super Saiyan Goku cosplay has been my most successful and most popular cosplay aside from my Ichigo cosplay. 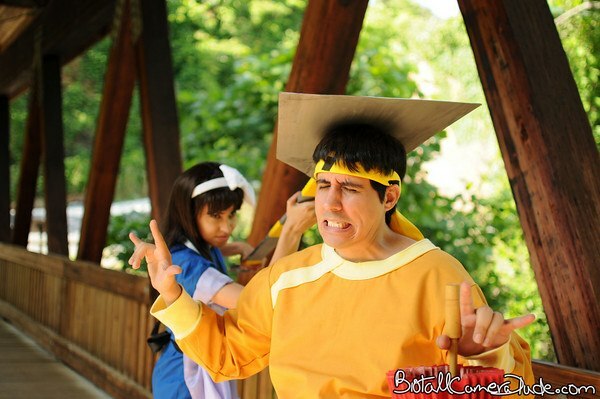 Everyone loves my Goku cosplay and has been featured all over the internet. What sets my cosplay apart from others is how I portrayed my Goku cosplay. Not only did we construct a realistic wig to match Goku’s Super Saiyan hair but we also did some great makeup effect to add to the battle damage look. Id say the best part of my cosplay that sets it apart from all other cosplays is that I work out to be in excellent shape to cosplay the characters 100% accurately. Thats why everyone loves my cosplays caus of all the hard work and dedication I put into my cosplays. For cosplaying newbies, I’d suggest looking for a character that is closest to you, or your body type. 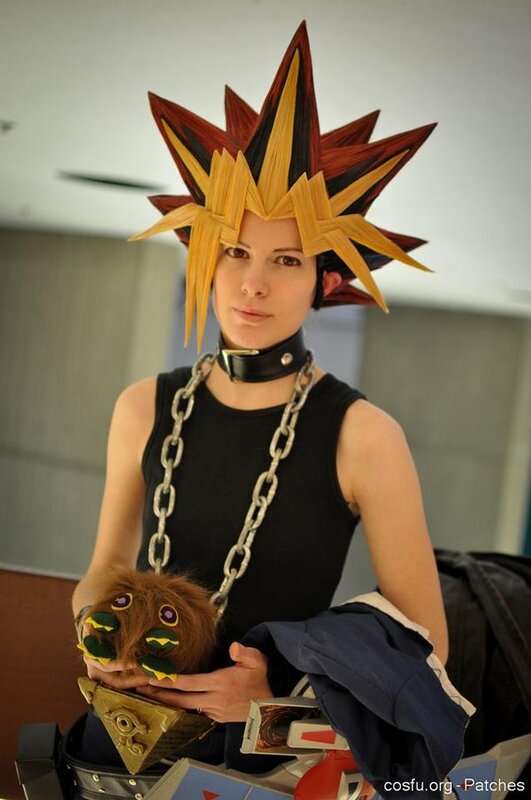 If you can, you’re already one step of the way to pulling of a good cosplay. You also want to make sure you have a good wig (if you need one) and basically, do your best. You want to represent the character as close as you can to the original. If you’re having trouble finding good quality costumes and don’t want to make one, there are many commissioners out there that you can hire. The conventions all be attending this year will be, Sac Anime, Sac Con, FanimeCon, Anime Expo, SDCC “San Diego Comic Con”, and a few others. 1. Hi Erica,thanks to join in our interviews,so please introduce you first. 2. 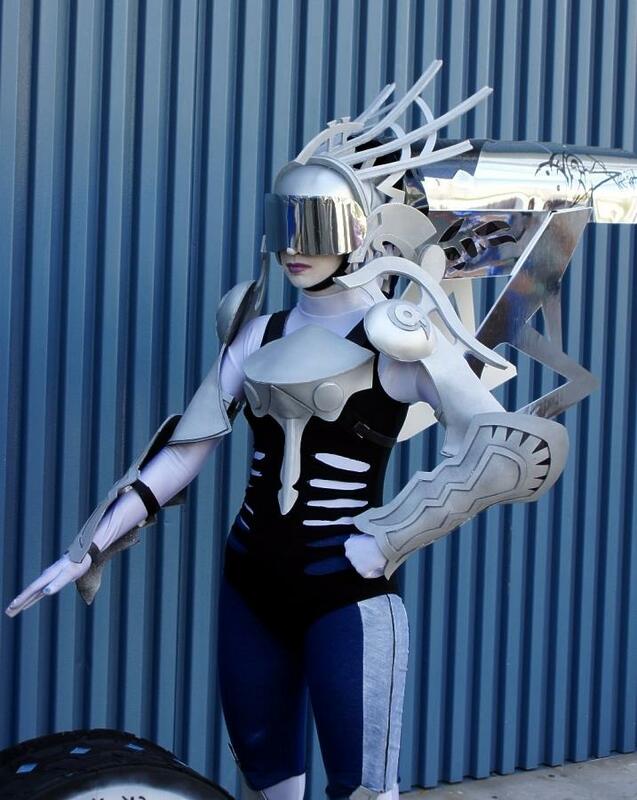 I noticed you’ve made many amazing cosplay, so how did you get started in with cosplay, what was your first cosplay? I got started in cosplay at my very first convention in January of 2003, but I had been sewing and making costumes for years before that! My first costume was a true closet cosplay, but by Anime Boston that year, I had made a Yuna (FFX) costume for myself and helped my friends with 4 other Final Fantasy costumes. I never turned back after that! 10 years later I am still going strong! With all the costumes I have made, it is very hard to pick a favorite. 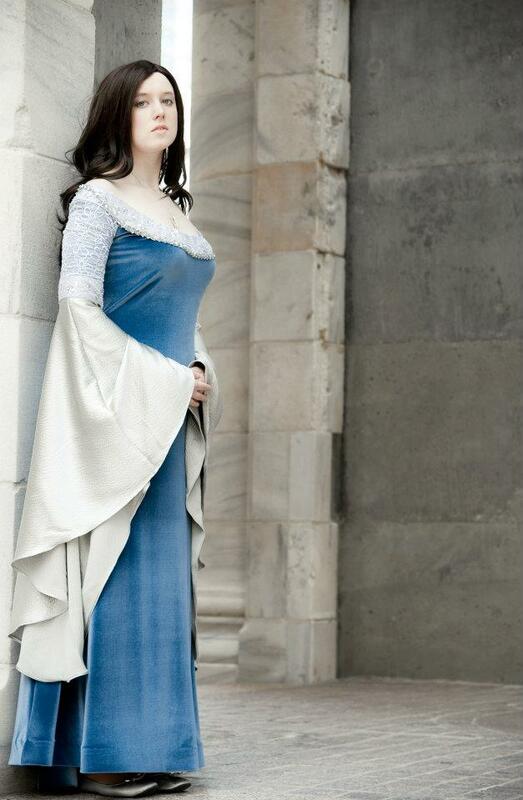 I love both of my Eowyn costumes from Lord of the Rings. 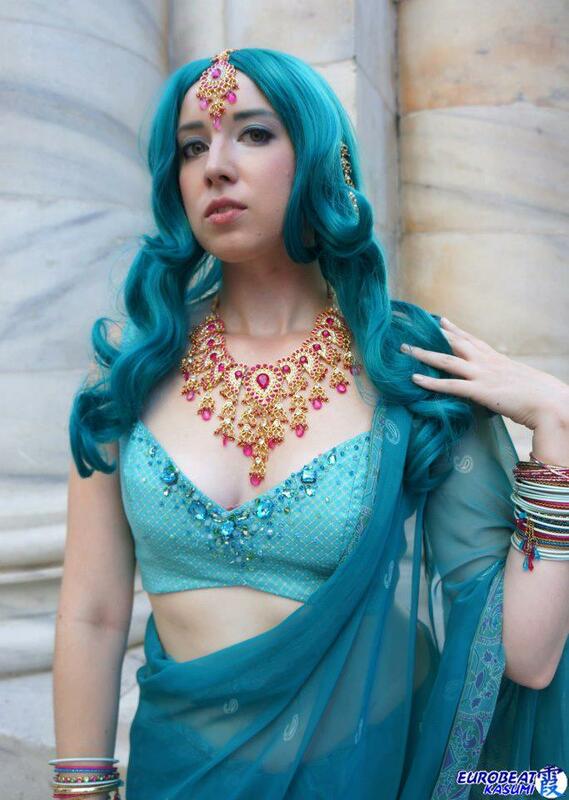 I am also quite fond of my recent original design based on Bollywood fashion and the Final Fantasy summon, Carbuncle. 4. Describe your creative process for starting a costume through completion.I see you accept cosplay commissions, so I think you can promote it to our readers as well. I tend to procrastinate a lot! I spend months thinking about the costume, how I am going to make it, what materials to use, etc… But then when it comes down to actually making the costume, I’m lucky if I start even a month in advance of the convention. I work quickly and have an excellent repertoire of techniques after 10 years of doing this, so I can usually get my stuff done in time, looking good! I am taking it easy and not accepting commissions right now, need to focus on work and school. I have learned so many skills and techniques through this hobby, but I have also learned that I cannot be perfect at everything. So I’ve learned to ask for help, consult or commission people who are true experts! I have, most importantly, learned not to take cosplay too seriously, anytime it starts to feel stressful or like work, I take a step back and reevaluate why I want to do it, for fun and friends! 6. Do you have one piece of advice that you would give to cosplay virgins? Never be afraid to ask for help! Introduce yourself to the cosplayers you admire and respect! It is a social hobby and we all can help each other be the best cosplayers possible! Also, do not let anyone tell you who or who not to cosplay as, this is your hobby and your choice! Do not listen to trolls on the Internet, they are just jealous. You are putting yourself out there when you cosplay and that does take courage and talent whether you’ve been doing it for 1 month or 10 years, so be confident, have fun, and ignore the haters. 7. Lastly, what is your con schedule looking like through 2013? Today Malindachan join in our cosplay interviews to share her real cosplay stotry. Malindachan is really hot in deviantart .Personally like her wig tutorials most,really step by step ,impressive! 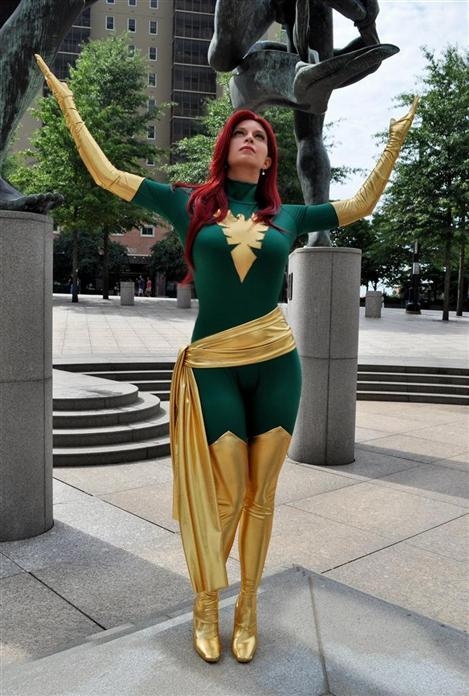 -Hi, my name is Malinda Mathis, and I go by Malindachan as my cosplay alias. 2.How did you get started in with cosplay, what was your first cosplay? -I got into cosplay during High School thanks to our Anime Club. My first real cosplay was in 2004 when I cosplayed Edward Elric for Halloween and for special Anime Club events. -It’s really hard to decide, though I’ve got a special place in my heart for Yusei Fudo. It’s the one I’ve worn the most, and it’s got a lot of fond memories attached to it. -First thing I do is look for tons of references so that I know every detail before I even start. Then I order the wig base! XD You never know if the place you want to order from will be out of stock or take a while to get to you, so I make sure I order it as soon as possible so I have enough styling time. I go to a local fabric store to browse for material ideas until I’ve picked out what I feel is the best match. But I will usually hold out on getting the fabric until it’s either on sale or if I have a coupon (cosplaying can be expensive!). I prioritize the stuff that is essential to getting done first, but I also like to switch around while I’m working on certain items so that I’ve got some variety going on. If I’m doing nothing but sewing for several days, I might no longer be motivated to sew later, so I’ll switch to something like props, the wig, or accessories for a while before going back to sewing again. I always like to listen to music or have a movie/show playing in the background as I work because I cannot work in silence. XD Taking progress photos as I go and sharing them with friends on facebook is also a huge motivator, because feedback can really help keep me going. 5.What is the biggest learning curve you have learned about the hobby in the past years? -I’ve learned lots of things about working with different kinds of materials and such, but the biggest thing this hobby has taught me is about my own self. I’ve become a stronger person thanks to cosplaying, and I’ve learned some values. 6.Do you have one piece of advice that you would give to cosplay beginners?and I noticed you made some amazing wig tutorials, could you tell us some key points for style a wig? -Never underestimate what you’re capable of. Experiment with new materials and techniques, and you might surprise yourself. I didn’t know I’d have a knack for wig-styling until I tried it. Next thing I knew, my wigs became the highlight of my cosplay work. Sure, some people might catch on faster at the start compared others because they either have an artistic eye or are good with their hands, but with how much variety there is in this hobby, there’s bound to be something that makes each person stand out. Some people excel at sewing, some are great with props or wigs, some are better at mimicking the characters’ personalities. Find your niche and work off it! 7.Lastly, what is your con schedule looking like through 2013? -I’ve got a huge convention lineup this year, especially because I work for Arda-wigs now and will be traveling to help work the wig booth. More will be added to the list for-sure, but as of now I know I’ll be at Katsucon, Naka-kon, Evillecon, Acen, Colossalcon, Cosplacon, Anime Expo, and Dragon*con. Some of them I’ll just be attending for fun, some are for work, and I’ll be a cosplay guest at two of them.